A love of color set the tone for this dynamic residence in Soulard where contemporary and historic stylings combine. 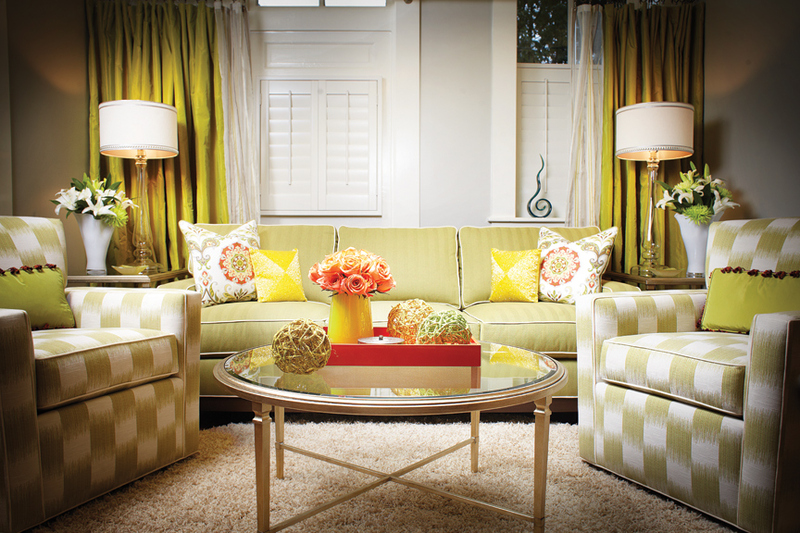 Shades of green are accented by bright pops of yellow and orange in the living room. 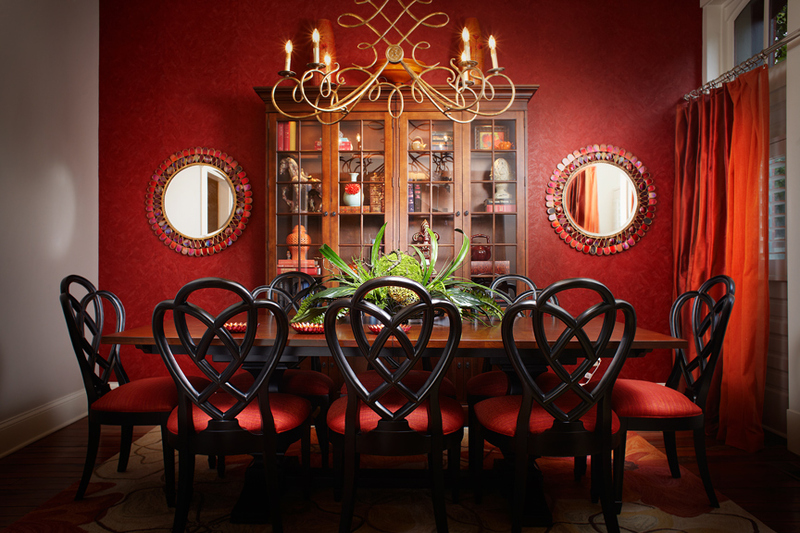 A rouge red faux Venetian plaster wall treatment makes a dramatic statement in the dining room. Paintable wallpaper in rich butter brings a playful pop of color into the entry foyer. The breakfast room table was Leah's mother's. Gray refinished the top in black to give it a more contemporary look. 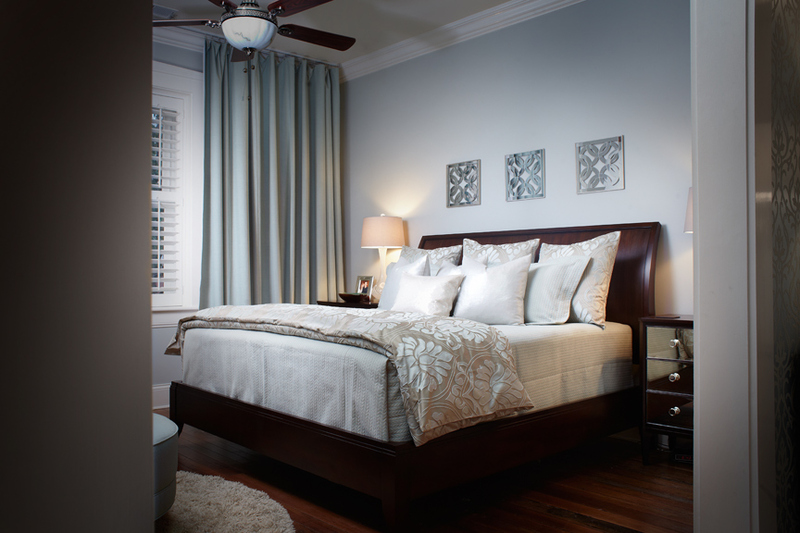 Subdued and tranquil, the master bedroom is splashed in soft blue/gray. The instant you meet homeowners Eric and Leah Sutphen, their colorful personalities and warm spirits immediately light up the room. So it is no surprise that their Soulard residence is bursting with that same color and character. Not afraid to let their love of vibrant tones shine, their three-story home is an eclectic mix of historic and contemporary. When the couple began their search for a home, there was no question the area they would look. “Eric and I met in Soulard, and it's where we gravitated towards,” says Leah. The walkability of the neighborhood was also a big plus. "Soulard is the land of Bohemia," quips Eric. "Live blues music, great food, charming historic architecture, art galleries, night life and so much more." With Leah relocating from Paducah, KY, and Eric from West County, the city lifestyle was one the couple both desired. Built sometime during the pre-Civil War/Civil War era, the couple knew this house was the one the instant they walked in. “At one point, Leah and I looked at each other and it was electric. We both said at the same time, 'This is it.'" Eric exclaims. The main floor had an open concept and a natural flow, while the two upper levels gave them the space they needed to accommodate their children when they came to visit. At one point, the home had been converted to a multifamily unit with at least three separate residences. Rehabbed in 2002 by City Lights Design, the home was updated with modern conveniences while retaining its historic charm. Both Leah and Eric appreciated the historic detailing of the home, but they knew they would have to make it work with their more contemporary aesthetic and lots of color. "We wanted to maintain the historic aspects of the home yet jazz it up," Eric says. "I like the contrast between restoration and industrial with a formal, elegant look." When they bought the house it was painted in shades of tans and taupes, but Leah and Eric are color people. “Luckily, the first time I walked into Eric’s previous home he had lots of color, so I knew it would work,” Leah laughs. To help the couple blend their style and colors, they enlisted Leah’s friend and interior designer from Paducah, Kenn Gray. “We really depended on Kenn to help mix our contemporary style with the historic home,” Leah explains. Starting with a palette of oranges, greens, reds and grays – colors Leah always loved – the design began to take shape. Kenn was inspired by nature and took a very organic approach in the color and design. “I love it when a client isn’t afraid of color,” he explains. “But your eye needs to be able to move about the space in a flowing fashion.” To keep the home from feeling too oversaturated, Kenn stuck with the same hues, but used softer versions in certain spaces. As soon as you walk through the front door, you are surrounded by a cheerful pop of pale yellow in the foyer. Leah and Eric aimed to recreate the feeling they felt the first time they walked into the home and wanted this space to set the tone for the rest of the home’s design. An oversized chrome-and-crystal chandelier by Southfork Lighting makes a dramatic statement and is a present-day take on a historic look. 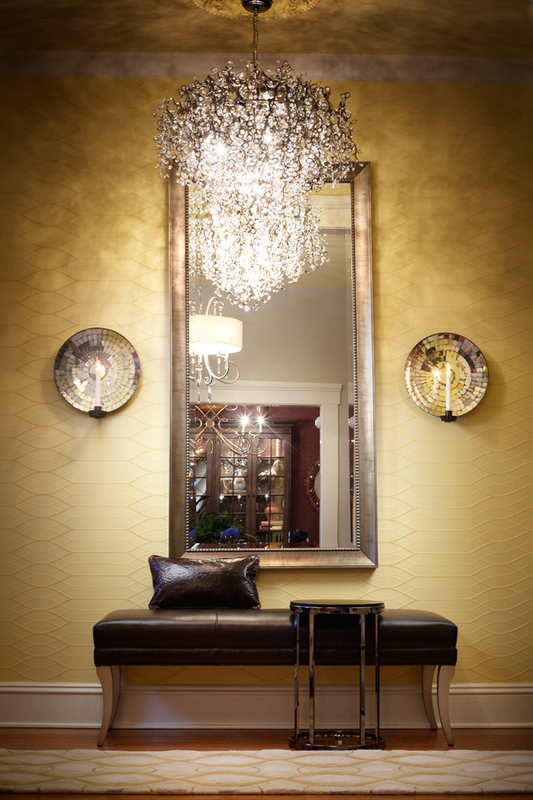 A leather-upholstered bench with metallic legs is positioned beneath a large metallic mirror. Paintable wallpaper in rich butter adorns the staircase wall and extends up to the second floor. The paper’s motif is a contemporary version of a historic theme. The yellow is repeated in the ceiling color in the foyer as well as the adjacent living room and dining room. With so much color in many of the spaces, painting the ceilings the same hue brings consistency and ties the rooms together. In the living room, shades of green are accented by orange and yellow. “The living room is the heart of the home and was on the small side, so furniture placement was key,” Leah explains. Instead of bringing in color via the walls, Kenn created a pear-hued seating area with two Ethan Allen Turner swivel chairs in a Westerly pear fabric and an Ethan Allen sofa in chartreuse green with cream welting. The biggest challenge the designer faced was the window treatments. Because the home had been divided into multiple units, the front façade had off-center windows and old doorways that had been closed off. From the inside the living room and dining room windows weren’t symmetrical. To mask the asymmetrical look, Kenn created a window treatment in chartreuse green silk that extends all the way across the wall. The use of a bright lemon sheer lining sewn to the ends of the larger panels gives a contemporary effect. 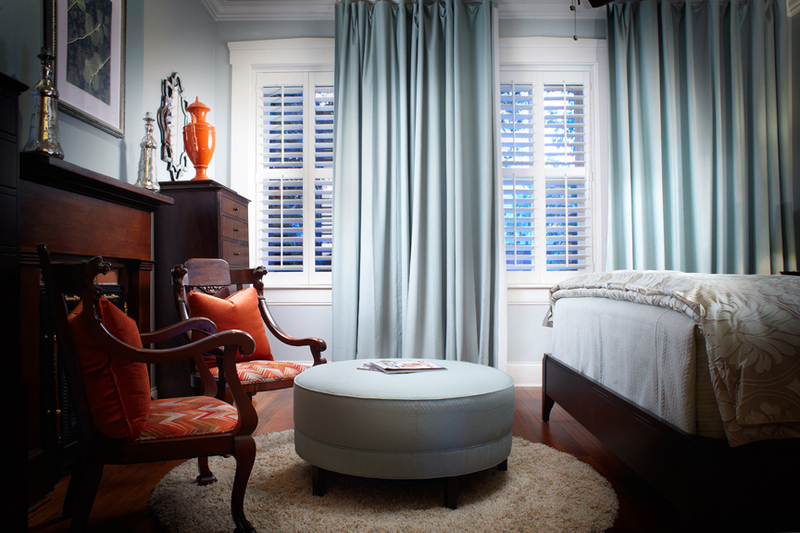 A similar window treatment is used in the conjoining dining room. 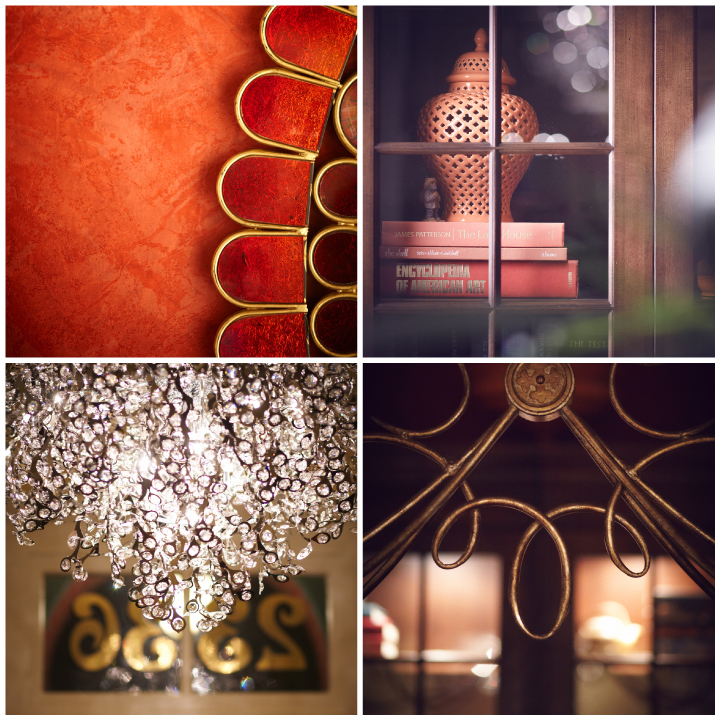 The focal point of the space is the faux Venetian plaster wallpaper in a rouge red. “This is one of the ways I hearkened back to the history of the property while creating an opportunity for a more contemporary pattern and texture,” Kenn explains. The wall serves as the backdrop for family gatherings around the Ethan Allen dining table. The ariel chairs, also from Ethan Allen, flow seamlessly with the dining room chandelier, which is a real nod to the past with its design evoking an Art Nouveau motif. The kitchen was one of the only spaces the homeowners did not change. Already updated with modern conveniences, the space only needed a touch of their style to make it complete. A round breakfast room table that belonged to Leah’s mother was made more contemporary by painting the top black. Vibrantly patterned sorbet slipcovers in a modern Moroccan motif were placed over the chairs to complement the color schemes in the dining room and living room. The entrance to the room includes a cozy reading nook where Leah loves to curl up with a good book. The original light fixtures were kept intact and Kenn mimicked the fixture's scroll in the wallpaper. The flocked paper has the feel of an older era, but it is more contemporary with the metallic finish and sand instead of velvet – just another way Kenn juxtaposes a contemporary atmosphere in a historic space. In the bedroom, a brilliant and bright pop of orange satisfies Eric and Leah’s desire for color. Two antique chairs placed in front of the fireplace were Leah’s great-grandparents' and came from her place in Paducah. “I knew I wanted to incorporate them in this home,” Leah says. She loves how Kenn worked them into the color palette in the bedroom, while the color also ties in with the main level of the home. Creating a home that truly reflects their personalities and style, Leah and Eric, along with their designer Kenn Gray, were careful to not negate the historical nature of the home but add a contemporary look to it. 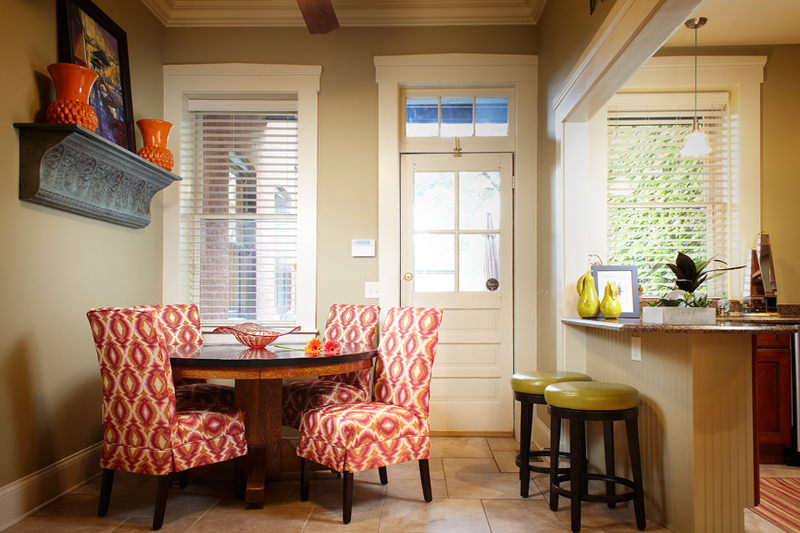 The result is a lively dose of color and sophistication in their dynamic Soulard residence.